People often wear contacts so that the prescription glasses do not hide their faces. Glasses, however, are being made by top of the line designers and companies that enable people not to be afraid of their bifocals. There are many ways to turn prescription glasses into a fashion statement. 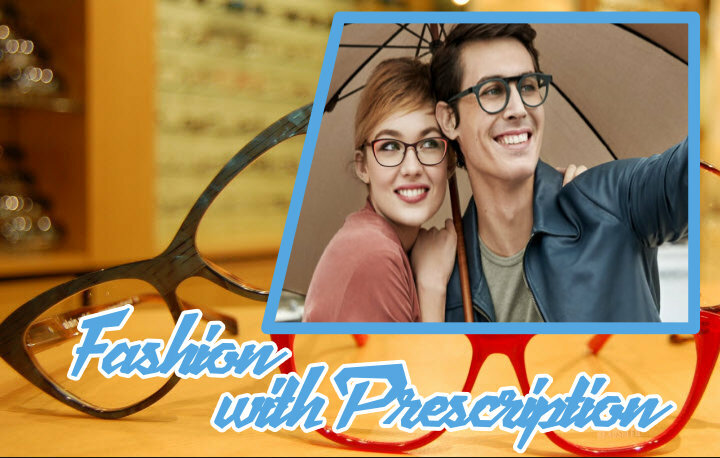 Wearing prescription glasses that have a solid color is a great way to blend your glasses into almost any outfit you want. When picking out a color for your glasses try and pick colors such as dark red, black, and light or dark brown. These colors are acceptable to wear in any job setting whether you’re an at-home writer or a secretary at a law firm. If you want to wear brighter colors such as orange or light blue you may want to have two pairs of glasses; one pair for work and one pair for wearing when you’re out and about. Certain colors look better with certain hair and skin tones. You don’t want your eyeglasses to fade into your face or take away from the natural beauty of your face either. People who have what is considered a cool skin tone have light eyes, light hair and a light skin tone. With a pale skin tone, you want your glasses to highlight your face, not outshine it. For people with a cool skin tone is best to wear rose, black or blue-grey glasses. For people who have a “warm” skin tone, it is best for them to wear the colors red, copper, gold or peach. Matching color with your skin or hair tone will ensure that glasses highlight your face instead of making it look garish. It is always up to you what color you wear but sticking to a guideline can help you find a color that works best for you. Wearing a certain eyeglass frame shape can change your face in a few different ways. If you have sharp features square frames will look best on you. Square frames will enable you to narrow some of your sharp features such as a strong forehead. If your face is more heart-shaped, you should wear glasses with no bottom rim. Having no rim to your eyeglasses will balance your jaw with your cheeks. Round faces should wear thinner rectangular glasses. These eyeglasses thin your face and give you a very sophisticated look. If you have an oval face, you are really in luck! Oval shaped faces can wear almost any shape of the frame and still look good. The only suggestion for someone with an oval face is to wear a wider frame. Shopping for fashionable eyeglass frames is really easy. You can buy frames from sites like amazon.com. Even easier, the next time you go to your ophthalmologist, he may sell glasses as well. A lot of ophthalmologists have dozens of name brand and fashionable glasses for a reasonable price to sell. The most important thing when shopping for glasses is to remember to pick a pair of glasses that express you and your style; when you do that effectively you will look great! We have lots of factories setup to handle rush orders. Call us immediately and let us know your drop dead date. Have your artwork ready to go—or tell us what you have. There may be a rush order charge, depending on the factory. Monday through Friday, 7:30 AM PST – 4:30PM PST. Pricing does not include shipping charges. In most cases, factories will ship UPS or Fed X, and we can use your shipper number if you tell us when placing the order. Overseas orders are either Ocean Freight or Air—and usually included in the pricing of the product. We invoice you on a single billing for all charges including product, setups, proofs, shipping and other miscellaneous charges that may be associated with the order. Do you offer the top brands of apparel? Yes, we sure do! Nike, Columbia Sportswear, Callaway, Cutter & Buck, Calvin Klein, Timberland, Van Heusen, Izod, Ashworth, Pebble Beach, Adidas, Reebook,Carhartt, Ogio, New Era and many more. We also provide top name brands in non-apparel such as Leatherman, Swiss Army, Cross, Leeds, 3M and more. Can you do early billings and ship later? How do I get payment terms? We require credit card payment on your first order, along with submission of credit information for us to evaluate. After review, we will have you sales rep contact you. PMS stand for Pantone Matching System. If your company logo has a specific color(s) used in printing and imprinting, then a specific PMS number is given to each color. We use the solid color matching system(C or U suffix). The factory may charge a fee to mix the specific color for imprinting. Full color is always CMYK—Cyan, Magenta, Yellow, Black. An inexpensive way to offer full color imprinting. Exact color matches are not available, but close. Setup for this is the same as a one color setup. Overruns occur when you’re using high speed equipment. Factories will run more than what is ordered to compensate for this, to try and get you exact quantity. If there are good overruns, you are charged for them. Certain factories producing certain items have guidelines/boundaries based on production history. Most of the time our factories try to get you exact quantity. Sometimes there are underruns, and you are only billed for what is shipped. Our product solutions help you create awareness and buzz of your brand to your customers and other target audiences. They help educate, motivate, recruit, recognize, reward and retain customers & employees. Event Marketing using promotional products is HUGE, and looking great in corporate apparel, uniforms and work clothes continues brand awareness.Promotional products have a 4th dimension—touch and feel, and that increases the brand impressions of your recipients. Call us at 800.858.8090—-we’d be happy to answer them to the best of our ability!